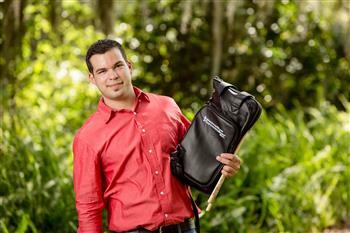 Elio Piedra began his career at the age of 10 at the Arts Conservatory Raul Sanchez in Cuba, specializing in percussion studies. From the age of 11 he got involved in the Jazz world and the fusion between Jazz, Rumba and Afro Cuban rhythms. He received musical influence from Hector Alonso, Benicio Lezcano, and Sergio M. Cardoso, whom created a strong classical base that prepared him for the future. At the age of 12 he began to participate in the most important music festivals in Pinar Del Rio, Cuba, as well as in the national music festivals. When he was 15 years old he began his music studies at the National Conservatory of Music in Cuba, where he toured with the symphonic orchestra around the country. At the same time, he began to perform with the popular salsa group “El Cumbre”, with which he became a well recognized drummer. When performing with “El Cumbre” he had the opportunity to perform with important musicians such as “Aguaje”, who was the director of the group “Buena Vista Social Club”, Magno Bisoli, who is a well-recognized Brazilian musician, among other guests from Belgium and Argentina. He participated in the longest Rumba festival in the world at the age of 17, in which he performed as a timbales player. He also performed at the “Rancho Club Show” in Consolacion del Sur, Cuba, and accompanied many recognized singers (as drummer), such as Maria Antonia Loriga “La Mora”, Marielena Lazo. Participated in the very important musical project “Internos La Musica” sponsored and directed by Luis Angel Sanches, who is the bass player for Pablo Milanes. Performed with the group “Sonora”, directed by Lazaro Reyes, as well as with the popular salsa group “Prisma” by Ricardo Perez, who is a recognized Jazz guitar player who lives in Germany. Furthermore, at the age of 17 performed as a guest in the “Fiesta del tambor” (known as Havana Drums Festival), a percussion festival. During his last year at the conservatory he performed in the “Jojazz”, which is the international Jazz festival sponsored by Chucho Valdez, from which he was selected to play with the famous musician Bobby Carcaces, as well as to record television programs and interviews. From the previous performance it was created a group called “Primera Mano”, with which he recorded an album called “Fantasia”. This group focused on the fusion between the Latin Jazz and popular salsa rhythms. With “Primera Mano” he had the opportunity to collaborate with the famous Adel Gonzales, congas player for “Buena Vista Social Club” and Irakere; he also had the opportunity to play with “El Macri”, the singer of AfroCuban All Stars, among other important musicians. He interacted with the “Bamboleo” orchestra, and the group “Klimax en la Capital” in Havana, Cuba. When he was 19 years old he recorded a music video with a pop group directed by Yoyo Ibarra. This music video was nominated for the “Premios Lucas” festival in Havana, Cuba.